When’s the last time your elderly parents had an eye exam? If it’s been more than a year, it’s time for a checkup, Emily Chew, M.D., a doctor with the National Eye Institute, reminds us in Prevention magazine. And the checkup might save their vision. Actress Dame Judi Dench recently revealed that she has age-related macular degeneration. This progressive eye disease—AMD for short—affects your central vision. See your eye doc once a year if you’re over 60. 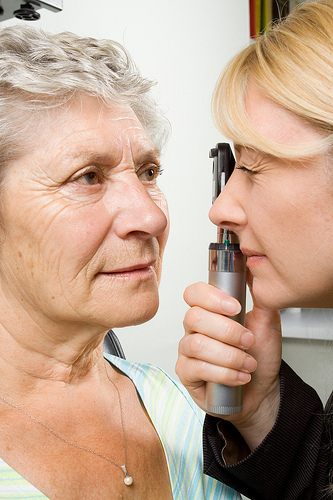 Early AMD shows no major symptoms, so you need a doctor to spot any changes in your retina. “By the time you get vision changes, [AMD] has already progressed,” says Dr. Chew. One noticeable symptom of wet AMD is that straight lines appear wavy. If you notice this change, schedule an appointment with your doctor right away. Prevention reports that about 1.75 million Americans have age-related macular degeneration. The article also includes prevention tips, including not smoking. February happens to be Low Vision Awareness Month, with an emphasis on macular degeneration. All the more reason to talk with your elderly parents about their eye care—and perhaps think about your own!